Any commercial building needs to have the correct measures in place to ensure optimum safety during crisis situations. Doorways need to be equipped with the appropriate Panic Hardware in order to maximise the practicality of any rooms that occupy a large number of people. For any single doorway structures, we have a selection of Single Panic Bolt models. These designs offer a simple and effective method to exit buildings efficiently. 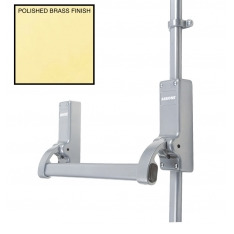 We have products that use a push pad mechanism as well as models that use a bolt. Twin structured doorways may require a Double Panic Bolt designs, which have been specially modified to provide rebated doorways with an equally effective process to leave buildings safely. These models have been made with high quality materials such as gold, silver, and stainless steel. An example of our Panic Latch range is the Satin Stainless Steel Single Panic Latch model. This product is perfect for buildings such as schools and restaurants, in which people could be required to leave rooms promptly. For a compact and simple method to exit buildings, we have a selection of Push Pads. These models have been made with precision and care to ensure your doorways aesthetics looks neat and tidy. The small design provides a methodical piece of panic hardware which requires very minimal space within any door. Finally, any of our Locking Attachments will provide doorways with optimum structural integrity. This is especially important for rooms which store valuable items as well as buildings which need to be safely locked over night to deter unwanted intrusion.